Mora bushcraft? Is it a good starter knife? Discussion in 'General Bushcraft Discussion' started by Larry Shaffer, Nov 7, 2018. Yes, we are!! But you're from the midwest?? DomC, Beach Hiker and MrFixIt like this. Clearly, you’ll find a lot of Mora fans here. I purchased 2 companions off Amazon three years ago for less than $20.00 each. At that price, I figured I’d have one for back-up, but haven’t needed it yet. Simple enough to grind a 90-degree spine and forced a patina. Welcome to the forum. DomC, Beach Hiker, Larry Shaffer and 2 others like this. Nope...just living here. Who knows where I'll end up next! Beach Hiker, Larry Shaffer, MrFixIt and 1 other person like this. Larry Shaffer, MrFixIt and Phantom X Chic like this. Beach Hiker, Hiwa, anrkst6973 and 3 others like this. One feature about the Bushcraft Black that I don't see mentioned often is the fine sparks it throws when using flint or chert, much better than other Mora carbon steel blades. Mora doesn't mention using a different steel in the Black, so I suspect at may be tempered a bit harder than the others. Whether moving the blade or moving the rock to strike the sparks, i prefer a careful "one stroke at a time" approach when a razor sharp knife is involved than the "strike-strike-strike" style I often see. Yes, the flint will chew up the smooth uniform 90 degree back edge a bit. It won't interfere with using the back on a ferro rod but it might detract a bit if you use that back for bow tillering. Beach Hiker, Larry Shaffer, JasonJ and 1 other person like this. tch1718a, Beach Hiker, Larry Shaffer and 2 others like this. I love the 746 handle. It's very comfy. Probably even better than the Bushcraft Black, which is great too. Beach Hiker, Larry Shaffer, Sasha 80 and 1 other person like this. So @Larry Shaffer what did you get? Beach Hiker and Larry Shaffer like this. Well... in the same sense that a 2" diameter piece of tree branch is as much a "stick" as it is a "log". I'd say the Terava line has more of a partial height full tang. It goes the full length, but not the full height. Yet it does not significantly reduce in size from the main blade forward of the ricasso region. Beach Hiker, MrFixIt and Larry Shaffer like this. For a person new to bushcrafting, the Mora is a great knife. Learn to use a knife properly with it. Learn to sharpen a knife properly with it. 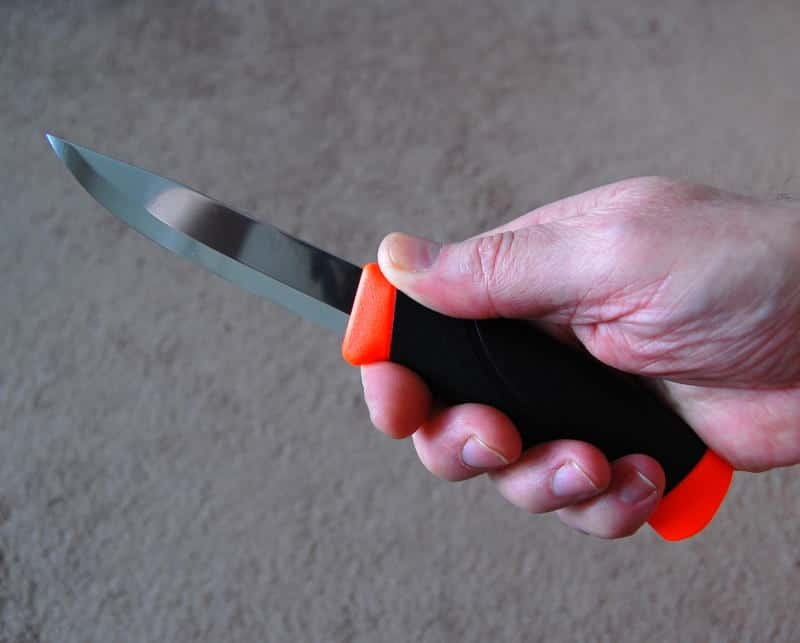 Do your learning on a high quality but inexpensive knife. If you must get pricey knives later, at least you will know how to use and maintain them. Also like Mora are the Opinel folding knives and Old Hickory butcher knives. Both are worth far more than their price and look bushcrafty. OiMcCoy, Beach Hiker, JasonJ and 2 others like this. Mora Companion is a fine knife. For a step up into your price range get a Garberg. You can consider Moras as starter knives but in reality they hold their own regardless of the user's skill level. I have a few nicer knives as well as a Companion with a custom sheath from a maker here on BCUSA. That Mora is a fine knife and yes, it gets woods time. Beach Hiker, Hiwa, MrFixIt and 1 other person like this. Yay. Another Pennsylvanian! (C'mon, we are the best, right?) First, welcome to Bushcraft. I have a few knives that I favor, but my Mora is my go to. It's inexpensive, and it works! Some people think that getting into bushcraft requires an investment. I'm here to tell you that it does not. Work with what you have, and if later, you want something more, go for it. Haha yes I think we are lol. Thanks! That’s what I’ve been hearing so I definitely want one. There’s another pa buschcrafter scottmm2012 he’s local and he’s actually giving me one of his older moras just as long as I pass it on to the next new Bush crafter. Which is absolutely amazing. Yep that’s what I’m doing I have old hatchets and saws and other old gear laying about so I’m making due for now! Beach Hiker, Outdoor Dauber and MrFixIt like this. Actually a fellow bush crafter scottmm2012 that is local to me is giving me a mora that he hasn’t used for a while. He said he will let me have it for free as long as I passed it on to another new bush crafter. Which I definitely plan on doing! This forum is so awesome and welcoming and I’ve only been on here for three days lol. So I’d gladly help someone in the future. I believe it’s a companion. highlander, Beach Hiker, Outdoor Dauber and 5 others like this. Yeah, but not before you blow hundreds of dollars on different knives because they have to be better than your twelve dollar mora right? Probably don’t even need to mess with fancy bushcraft model, just get a companion. Absolutely! Either the Craftline Pro or the Companion series for less than $20 and have an excellent outdoor/bushcraft blade! Beach Hiker, JasonJ, Larry Shaffer and 1 other person like this. Outstanding gesture on @scottmm2012 's behalf! Beach Hiker, Crusher0032, Outdoor Dauber and 2 others like this. I believe it’s a companion. Yep, its a Companion HD (Green) with a few mods, like hunter orange paracord wrapped sheath (just in case it is dropped), filed the spine to 90° so you can use it on a ferro rod. Don't throw the box away without looking through it completely. There may be some other goodies in there. Sending it out today. schapm, AnthemBassMan, Beach Hiker and 6 others like this. Very generous of you fellow Tribe member! Beach Hiker, Crusher0032, Larry Shaffer and 2 others like this. There are other good options in the 50-100 price range. IMO one of the best values is the Terava Kaakaripuukko. MrFixIt, Beach Hiker, woodsranger and 1 other person like this. MrFixIt, Beach Hiker, Broke and 4 others like this. Wow thanks @scottmm2012 I’m was excited before lol now I’m even more excited! Thanks again by the way it’s a great help! MrFixIt, Beach Hiker and aaronu like this. I'd go with a Companion or Companion HD and save yourself some $$. 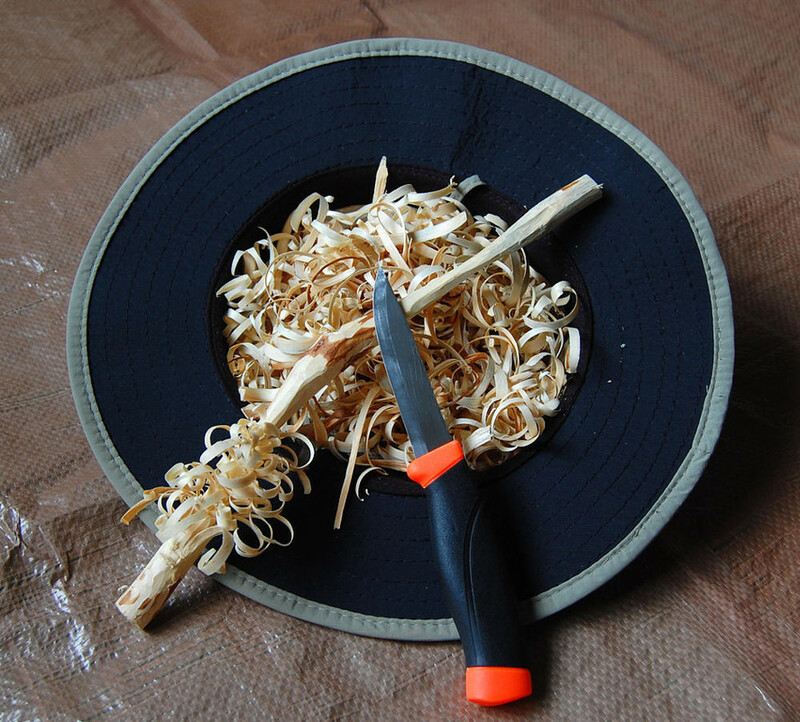 For the same money and an even stouter knife, the Terava puukko is as indestructible as they get before a jump to a MUCH spendier 3V knife. But there really is no real difference in toughness between a Companion HD and Bushcraft Black. You get a blued blade with a squared spine and different sheath for the BB but the spine can be fised with just a file on any of their other knives. My Companion has served me very well and I baton with it all the time. It hasn't failed yet which is surprising since it has a big inclusion in the middle of the blade that I just sharpened to. It should have failed by now considering this but nope. I'm deciding whether I want to spend the postage to ship it for a warranty return or just spend the $14 for a new one. 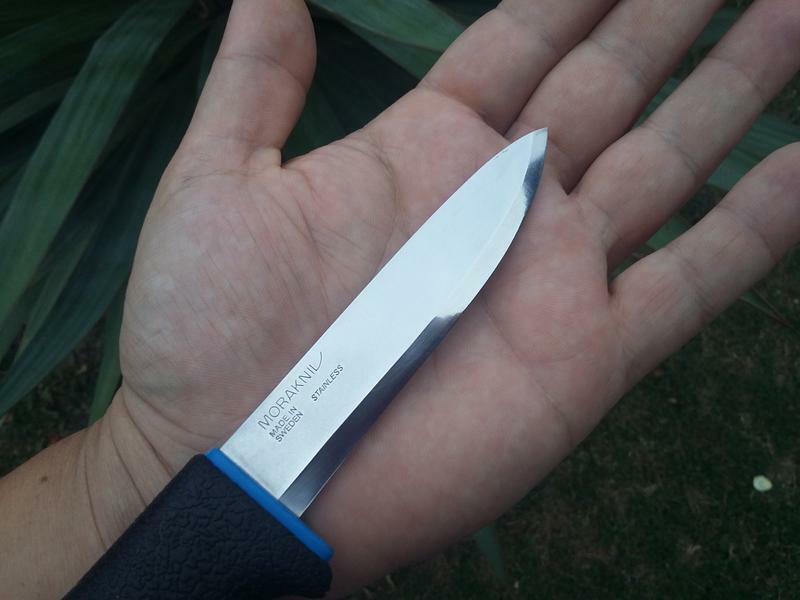 If you want stouter for around the same money, the Companion HD or Robust are crazy tough but thicker blades don't carve as well. 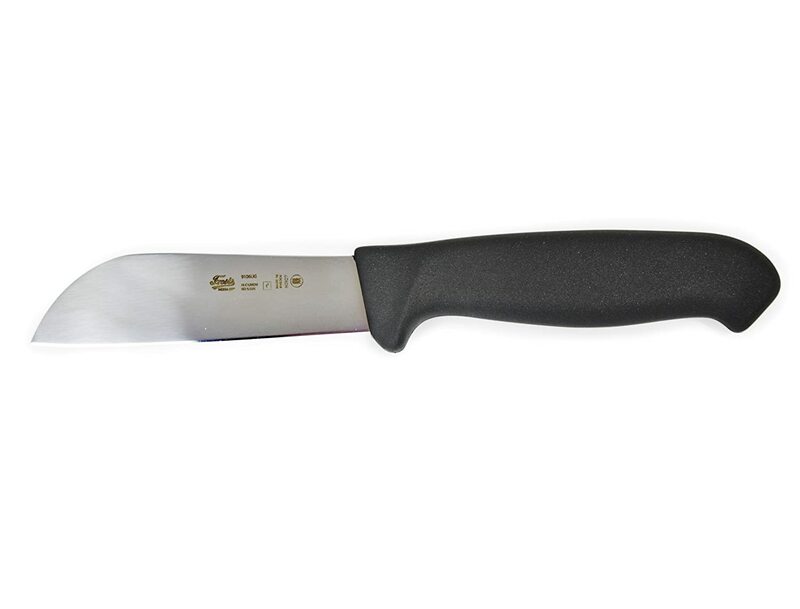 If you are set on a scandi for a first knife, I'd also get a thin slicing knife for use around camp. This can be an Old Hickory (They come rough and need some sharpening to get usable) for under $10 and a "replacement Kabar leather sheath" for another $10 and you have a knife/sheath combo that is very hard to beat. Another great slicing knife option is an Opinel folding knife. These are extreme value knives that slice like a dream! Can probably get a Companion (or 510/511) plus Old hickory and sheath plus an Opinel for less than a Bushcraft series. MrFixIt, Crusher0032 and Larry Shaffer like this. Nothing wrong with the Moras that sell for under $20 either. Actually, I lied. My most expensive Mora/ Frost is the bait knife at around $23. And it doesn't even have a sheath. MrFixIt and Larry Shaffer like this. The OP inquired about the mora bushcraft carbon steel which is around $45 to $75 so yes, I recommended something under $20. MrFixIt, RickWA and Larry Shaffer like this. I would have preferred a Bushcraft carbon, but the $20 stainless one was a no-brainer. Actually, I prefer the somewhat thinner and less expensive ones. DomC, MrFixIt and Larry Shaffer like this. Mora Companion HD in carbon seems to be running around $19 at present. Midway USA has some good prices on Old Hickory knives. $6.99 for a 7" butcher knife. I will probably be the only one to say "No". Get a knife with a normal edge (one that is not 3/8" or more wide) and learn to sharpen it properly. DomC, Larry Shaffer and buckfynn like this. Sounds like you already have a blade on the way, but too would endorse the Mora Bushcraft. However, I will add that after trying tons of knives (including the Mora Bushcraft and Companion HD) that my absolute favorite for bushcraft is the Terävä Jääkäripuukko. It's inexpensive and just feels right in my hand. The Mora will serve you very well, but when you catch knife fever again I would highly suggest you take a look at the Jääkäripuukko. DomC, MrFixIt, Larry Shaffer and 3 others like this. DomC, MrFixIt, Larry Shaffer and 1 other person like this. UPDATE: I received the packed today in the mail that @scottmm2012 sent me with a mora companion hd along with some other goodies which I’m completely ecstatic about! Big thanks to Scott for helping me out so much! DomC, DavidJAFO, Outdoor Dauber and 5 others like this. If you have a Mora, I have two, a 510 and an HD Companion, the only two knives I have, you get to join the Mora Tribe. DomC and DavidJAFO like this. DomC, beestokk and MrFixIt like this. Hey everyone I’m just getting into bush craft and I wanted to get a relatively cheap yet reliable knife for strictly bush craft. Have any of you used the mora bushcraft carbon steel and would you recommend it? Also if any of you would recommend another knife in the 60-100$ range would be greatly appreciated. The Bushcraft Black is a good knife. In the reviews page you will find a review I did of mine (the survival version). But, for less money you could get the Real Steel Bushcraft II. D2 tool steel, G10 scales, Kydex sheath, full tang. It also is slightly thicker then the Mora, meaning it batons much better. And it also has a true scandi grind, meaning it’ll even feather stick as well, maybe better! The only downside of it is that the D2 steel is supposedly more susceptible to chipping, although it has yet to be a problem to me. My mora Bushcraft black had many problems with the sheath, including having the belt clip snap, losing any form of retention in it meaning that when it’s free swinging belt loop swung up when I was running, it could easily fall out. Also, the free swinging belt mechanism wore away part of the handle... so if you do by the Mora, get a new sheath immediately. Overall, I prefer the Real Steel Bushcraft II. 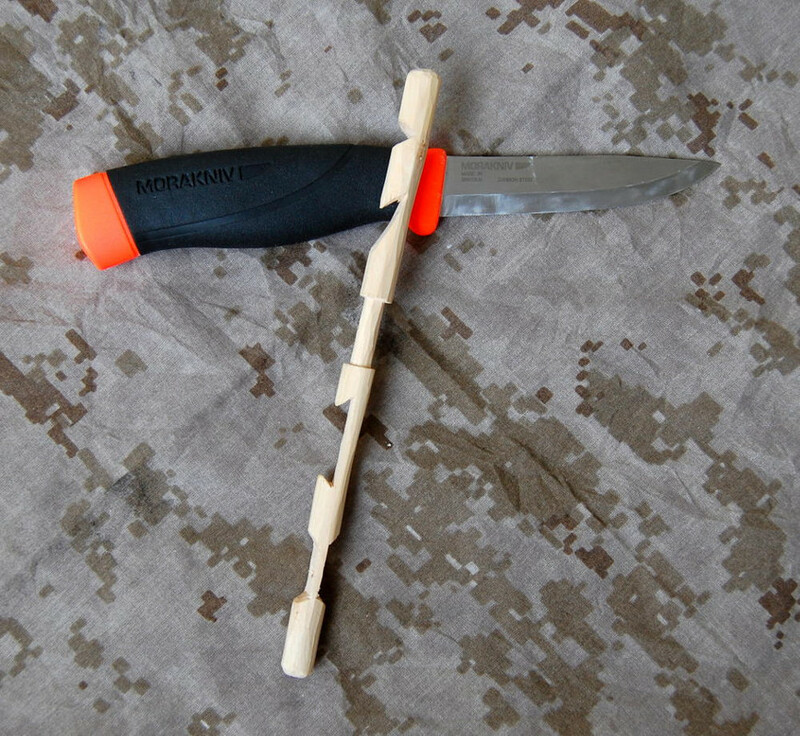 Larry, all of my experiences with Mora are good ones but I've never used the Bushcraft model. Take a look at the Real Steel Bushcraft 2...I am very happy with mine. Full tang, D2 steel, G10 scales and liners and a kydex sheath for right around $55. DomC, MrFixIt, Outdoor Dauber and 1 other person like this. DomC, BushcrafterAU and Outdoor Dauber like this. LOL...yeah, I did. I'm just slow sometimes! DomC, BushcrafterAU and MrFixIt like this. DomC and BushcrafterAU like this. I literally just purchased the Bushcraft black . I like the way the handle fills my hand . And as for a good "Beginners" knife ? It's a good knife period ! I've said it before and I say again . When you need a knife to be a knife a Mora is as good as any . Larry Shaffer, BushcrafterAU, DomC and 2 others like this. I bought a Bushcraft orange, though I haven't used it yet. Someone (here?) clued me in that Woot was selling them for $20. Couldn't resist. Edit: The only problem with the Bushcraft Orange is the color. OMG Wake the Dead Orange. It is so bright I keep it a cardboard box at night. With the knife in the sheath, I could direct traffic with it. I wish I had a flashlight that bright. Woof! A blind man wearing dark glasses would have a hard time losing it in the woods. Larry Shaffer, BushcrafterAU, marbleman and 4 others like this. I got mine from Sierra Trading for $29.99 . For $20 your not expected to resist . What , are you a super human ? BushcrafterAU, DomC, USMCPOP and 1 other person like this. No, just a Morawhore. Lotta bang for the buck. SkipJunkie, DomC, beestokk and 1 other person like this. Get what mora makes you happy. I still want the Bushcraft with the sharpener and fire steel. But, I am happy with my first (Companion HD) and my second (Garberg) and third (Eldris) and forth (hook knife). I went to stainless because I’m lazy. But from my dealings with restoring cast iron, a little rust won’t matter if it does happen. Larry Shaffer, DomC, beestokk and 1 other person like this. Have any of you used the mora bushcraft carbon steel and would you recommend it? 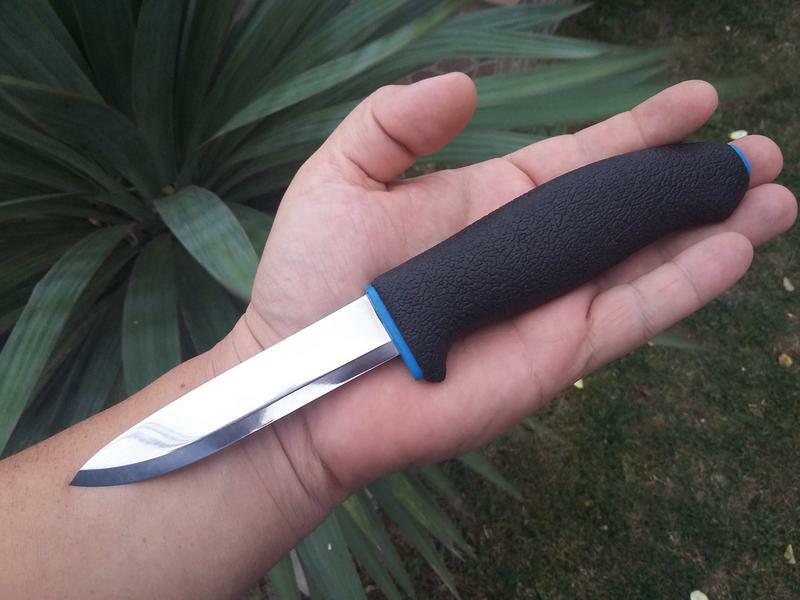 My first Bushcraft fixed blade knife was a Classic 2 in carbon steel. Still own it and it holds a special place in my heart to this day. Larry Shaffer, Glock Holiday and Broke like this.